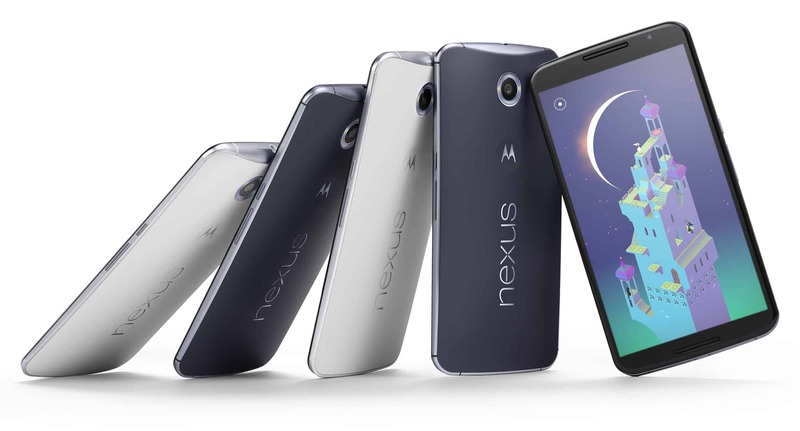 The Nexus 6 Is Definitely A Big Phone So Get Your Pockets Ready! 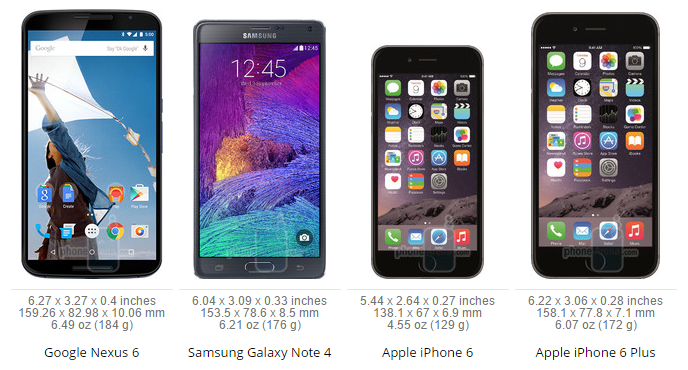 In this world of big phones it seems the sizes are always increasing. Just a few years ago many people scoffed at the idea of the original Galaxy Note, which featured a 5.3-inch screen and was considered gargantuan for nearly all but the giants among men. Nowadays pretty much every phone is at least 5-inches, and most are 5.2-inches or higher, with phablets still pushing the boundaries of what can still be considered a phone and what moves straight into tablet territory. Google’s latest device launches itself straight from a standard sized phone in the 5-inch Nexus 5 to a massive 6-inch Nexus 6, which is gargantuan by any standards. But is this just another Galaxy Note type of paradigm shift, or have we moved into true insanity territory? 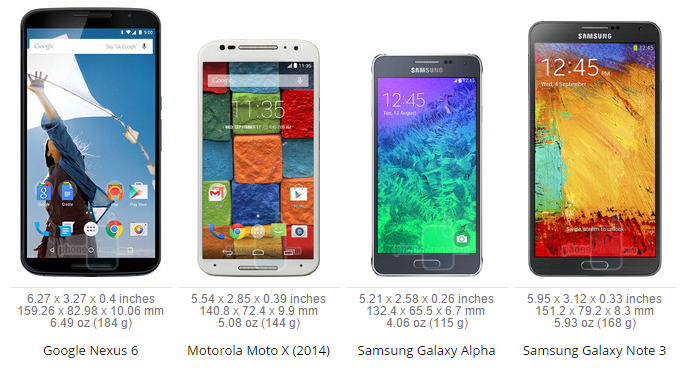 Let’s take a look at the Nexus 6 next to a smattering of other devices. Thanks to Phone Arena’s excellent sizing app, we’re able to take a look at how the Nexus 6 stacks up against all the other phones you can buy this year, and just how much bezels really do matter when considering the size of the screen. First up we’ll look at how much bigger the Nexus 6 is than the Nexus 5. You can see that it absolutely dwarfs the Nexus 5 in every way, but proves just how long bezels can take you when matching up to the Sony Xperia Z3 and the OnePlus One. When Apple announced a larger iPhone many people laughed at the size of the device, as it sports a 5.5 inch display but is considerably larger than any other device with a 5.5-inch display because of its massive bezels. The Nexus 6 shows just how true that is as the device is nearly the same size, height wise, as the iPhone 6+, but the screen is almost a half-inch bigger. Samsung’s Galaxy Note 4 shows its minimal bezels as well, and even though it’s got that large home button on the bottom the bezels are super small and keep the device under many other 5.5 inch phones. 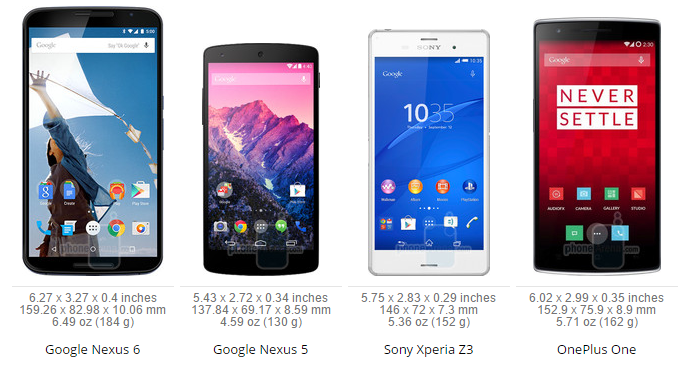 Comparing the Nexus 6 to other flagships that launched just a few months ago shows just how much more grand of a design Google was going for. A nearly 6-inch screen can only be mitigated so much by lack of bezels, and even though it looks like the Nexus 6 might have the same size bezels as the G3, the extra half an inch makes it a little too big for some. Last but certainly not least is looking at the Nexus 6’s little brother, the 2014 Moto X. Since this is a Motorola Nexus it’s pretty obvious that the design language from the Moto X was used here, but with added benefits. While it’s considerably larger than the Moto X it does feature dual front-facing speakers instead of just the one that the Moto X has. 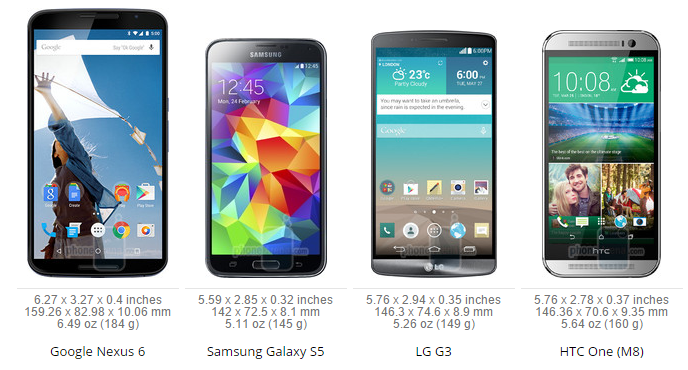 If the Nexus 6’s size doesn’t frighten you away you’re going to get a mostly superior phone here. Still this is one absolutely massive phone, and likely the biggest phone that most people will ever see with their own two eyes when it makes its way onto carrier shelves worldwide in the coming weeks. The post The Nexus 6 Is Definitely A Big Phone So Get Your Pockets Ready! appeared first on AndroidHeadlines.com |.